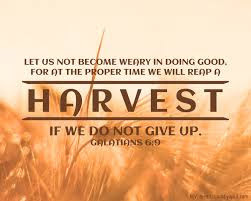 On Wings of Eagles: Your harvest depends on when you sow. The Bible says we will reap at the right time if we don’t grow weary (Galatians 6:9). That means you don’t sow your seeds today and go out tomorrow looking for the harvest. There is a time gap between sowing and reaping, unless God overrides this gap through a miracle. But remember, miracles are not God’s normal way of operating. There’s the sowing season, and then comes harvest season. So don’t get frustrated if what you are sowing for Jesus today doesn’t come to harvest tomorrow. The key thing to remember is that the season between planting and reaping in God’s harvest doesn’t mean that nothing is happening. He is always at work; sometimes it’s just underneath the soil. So allow a season for reaping knowing that even when God is silent, He is not still. God is after your long-term benefit, not just your short-term pleasure. Do you need help waiting on God? Pray for understanding that He has a plan, even when it’s not visible to our earthly eyes. Dear Lord, we pray today that we would understand Your plan today. Help us not get discouraged when things don’t seem to go as we think they should. In the Name of Jesus, Amen.